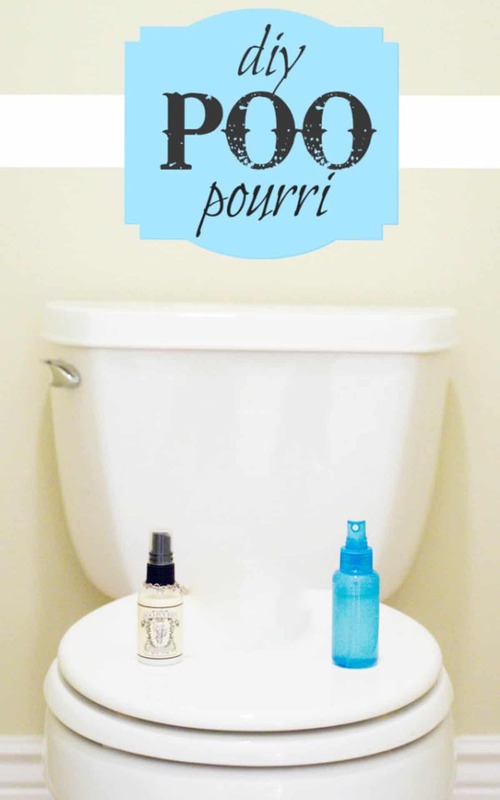 DIY Poo Pourri Recipe to save money & Get RID of that stink! 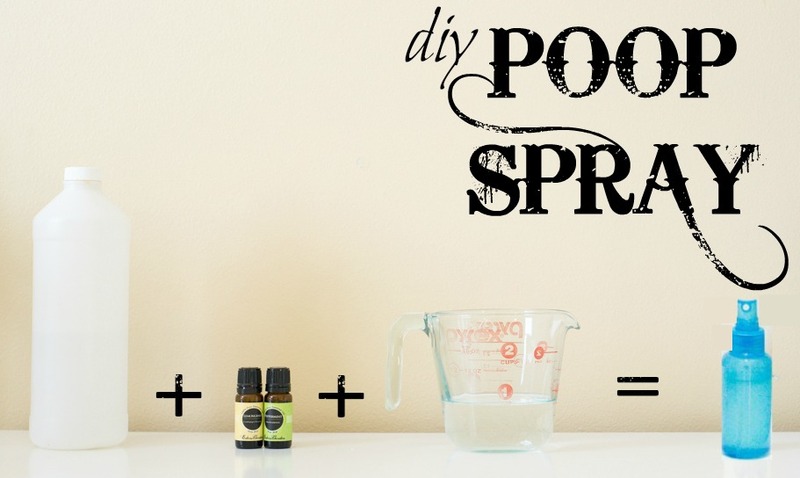 Today we’re making our very own poo pourri recipe from scratch…. because everyone poops! Or so says the classic children’s book. And because we’re talking about bodily fluids (solids), I’m really feeling a need for my inner 9-year-old scouting self to let the potty jokes fly. That’s what happens when you’re the local Cub Scout Bear leader, I guess. Join with me, this is a safe place. Every old wench has her own special stench. Poo Spray. The most craptastic stuff you’ve ever had the displeasure of needing. I’ll spare you the rest because it only goes downhill from here. And then it had a permanent place of honor in our bathroom. Anyway, after experiencing this little magic in a bottle I can safely say he’s a fan too. After I, ahem, put it to use, I thought I recognized a certain favorite smell: essential oils!! After researching it further, I discovered the poo pourri ingredients are basically comprised of essential oils, alcohol, and water all gussied up in some pretty brilliant packaging. Translation: perfect for an easy DIY’er project. These poo pourri ingredients work because the essential oils create a physical barrier, trapping the stinky smells below. Basically, you could have a chili cheese dawg blowout nightmare in the bathroom and no one would ever know. EVER. Is that incredible or what? Where was this during my dorm days? So, I got to work in the lab, errr.. kitchen and came up with a perfect copycat clone. I’ve had family members try both products (original and homemade) in a double-blind test and the results clearly indicate the DIY is just as effective as the original. In other words, we use them interchangeably and they both work great. 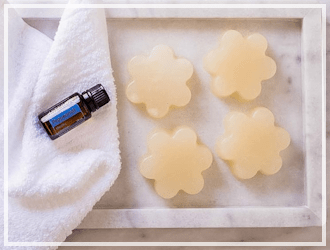 I am a huge fan of DoTerra pure essential oils in all my DIY projects and for health too. The oils they use for the poo pourri ingredients are bergamot essential oil, lemongrass essential oil and orange essential oils. However, I have used all kinds of oil combinations such as lemongrass and peppermint, or lavender and orange. During the holidays I even use a pine smell. If you are interested in buying some of these pure essential oils you can order some here from me. The original big brand costs $9.95 for a 2 oz. container. And that’s not including shipping. That’s $4.98 per ounce. Water: Free. Sure, I pay my water bill every month, but it’s a set amount so my bill would be the same whether I make this spray or not. Total Cost: About $.52 for a 3 oz bottle. Or $.17 per ounce. You guys. That’s more than a 96% savings!!!!!! And we didn’t even include shipping! Surely if that isn’t the definition of a Happy Money Saver moment, I don’t know what is. I think this would be the perfect something to leave in a guest bathroom. Isn’t it the worst to have the #2’s hit while you’re at someone else’s home? This is right up there on the essential hosting needs list. Your guests will thank you. And maybe you’ll thank your guests when they put it your poo pourri recipe to use. Win-Win! 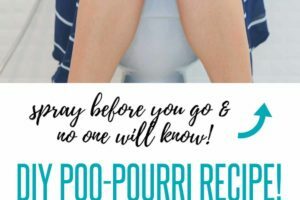 An easy to make DIY poo pourri recipe copycat that is sure to keep your bathrooms smelling fresh, even after you do your business. 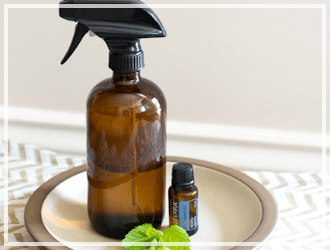 Pour rubbing alcohol in a 3 oz spray container and add essential oils. Add water to fill the container. Give it a good shake and you’re ready to go! I’ve found 3-4 sprays is enough to cover the bowl and trap all of the stink particles below. Give it a good shake and it's ready for use. 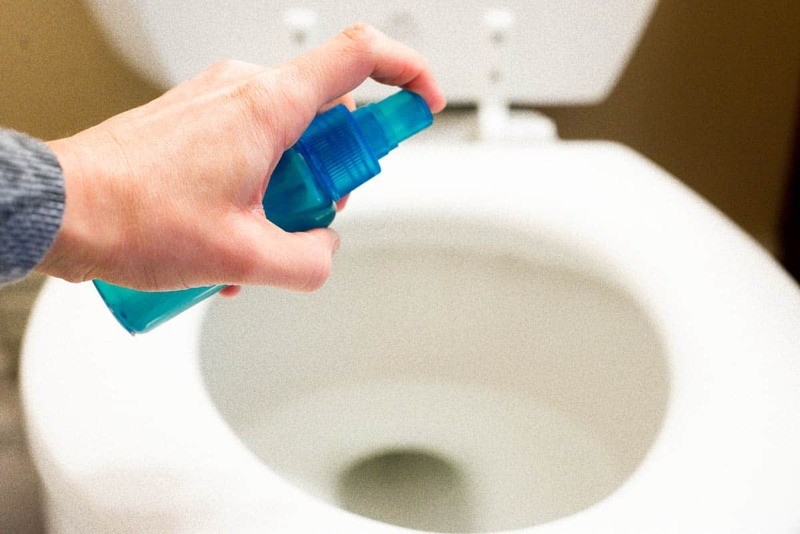 Before you go poo in the toilet, spray on top of the water 3-4 sprays which will create a film, trapping the poo smells after you go. Then do your business and flush. 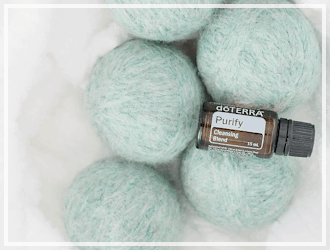 Let me know your favorite oil combinations—I think it would be fun to create different smells for each season. Summery citrus, woodsy fall, and cinnamon spice for winter. The combinations are endless! THIS WORKS!!!!! I bought rubbing alcohol JUST for this recipe a few days ago at Walmart and guess what? I couldn’t find it anywhere!! SO, I used hand sanitizer! It worked perfectly. I also used delicious lavender and orange Doterra oils that someone sent me recently 🙂 perfect. Thank you for the recipe. I love your sense of humor too. I read it to my husband and thought it was hilarious, and sooooi true. Im in NZ and ‘poo pourri’ has only recently come onto the market here within the last 8 months and the first advertising they had for it were absolutely cringe-worthy cheesey TV adverts. Now I am going on holiday soon – spending 3 days on a train between Sydney and Perth, Australia so I decided that despite the bad adverts I would get me some for the trip. Not sure what they charge in US but they are like NZD$13-$14! a little bottle here in NZ so I was ‘hell no’ and found this recipe. 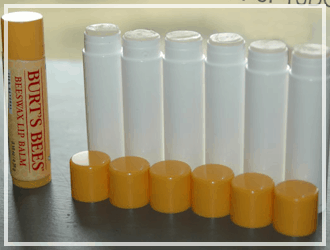 at my local dollar store I picked up some small cheap plastic travel bottles with spray tops (NZD$1) a small bottle of oil for fragrance burners for NZD$2.50 and then got a bottle of rubbing alcohol/isopropyl alchol at the chemist for NZD$8 for 50ml (1.69 fluid ounces) was quick to chuck together and it works like magic. I have found that I still need to shake the bottle before use though as the isopropyl alcohol hasnt stopped the oil from separating from the water, not sure if thats because Im using a cheap fragrance oil rather than a pure essential oil so will try pure oil another time. Would like info on the oils that u use please. This is sooo cool. I made it, and it works! I have IBS and makes for self consciousness at work no more! Thanks for posting this. 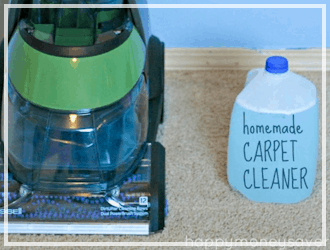 I used my fave oil sweet pea and it’s much more pleasant to me. I have read that rubbing alcohol is very bad to inhale? Ive been trying to make my own poo fragrance but I found that when I followed a recipe the final end smell seemed very week and hardly noticeable when sprayed into the loo. Perhaps its the pure essence of lemon oil I’m using. 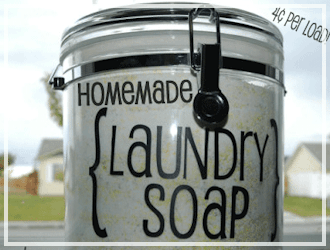 Could you advice me a product which give out a strong smell of lemon when mixed with the other ingredients. 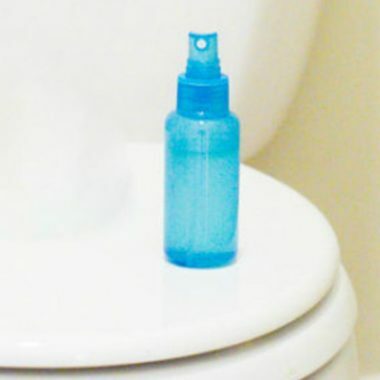 Thanks a lot for your Poo Fragrance Spray recipe! I love this stuff! Awesome! I’ve not used rubbing alcohol before… Can you use witch hazel instead? 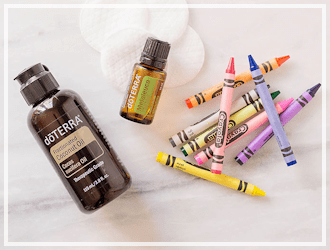 I would like essential oil combinations.